While the fire was a massive tragedy, the damage did not end with the loss of the $100 million building. The condo building was built in 1971 at a time when asbestos was used in most aspects of construction and manufacturing. As our Boston mesothelioma attorneys can explain, asbestos had been used for thousands of years prior the Industrial Revolution in the U.S. and Western Europe. Asbestos, contrary to what many believe, is not man made. It is actually a naturally formed mineral that is comprised of six silica elements. It has the remarkable ability to resist head, fire, caustic chemicals, and electricity. This made it seemingly perfect for use in applications such as fireproof insulation, fire blankets, and as protective wrapping for pipes. However, it was later discovered to be an excellent agent to assist in the forming of chemical bonds, especially in glue and adhesives. This meant it could be used a binding agent in cements used to make tiles, drywall, and roof tiles. It could also be used in all kinds of gaskets and seals, and as the biding agent in wall joint compounds, and a special type of construction adhesive known as gun plastic cement. One of main products that has lead to countless cases of mesothelioma over the years is known as Colton Gun Plastic Cement. While asbestos had some very favorable qualities, it also poses a serious hazard to human health. When plaintiffs inhaled or ingested the deadly asbestos fibers, they could become lodges is a layer of protective tissue known as the mesothelium. Once trapped there, the body has no way of expelling them and there is not much doctors can do remove them over. Over a period of 20 to 50 years, they can metastasize into a deadly form of cancer known as mesothelioma. According to Hawaii News Now, the local department of public health is still investigating serious alleged asbestos violations and has issued fines to the city fire department related to asbestos safety violations that allegedly put firefighters at risk for asbestos inhalation during the rescue and recovery efforts. When firefighters arrive at the scene of of a fire, they wear special protective equipment including fireproof pants known as bunker pants, insulated jackets with reflective tape, and they also a wear self-contained breathing apparatus (SCBA). This is similar to SCUBA gear except they are designed for use in fires instead of use underwater. All of this equipment is known a the firefighters’ turn out gear. Health inspectors have alleged that when the firefighters left the blaze, all personnel that had been in the building were supposed to be told to hand over their turnout gear for inspection and to be sanitized if necessary. The fire department was allegedly supposed to have all personnel go through required decontamination protocol, but that was not done properly. Some firefighters did not bag and submit their turnout gear until they returned to the station following the blaze, and some fire companies did have their people turn in their gear until the end of their scheduled shifts. The fear was that the deadly asbestos fibers were possibly spread to the other personnel at the station and anywhere else the firefighters had gone following the Marco Polo fire. In this case, the fire was $7,000. When a firefighter goes into a burning building, he or she understands the risks. This could include risk from fire, smoke inhalation, and debris from the collapsing structure, and in the case of old buildings such as the ones in Boston, there is also the risk of asbestos exposure. Those who did not sign up for the brave and dangerous job, including the firefighters’ families also did not sign up for the risks. However, there were many workers over the years who were unknowingly exposed to asbestos and did not go through any asbestos protocols before returning home to their families. 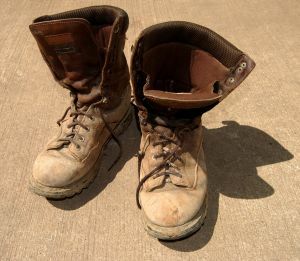 When they would get home, they would hug their family members and leave their dusty boots by the door or would walk through the house wearing them. As they did this, the dust would be spread all over the house and this would possibly exposure spouses, children, and other people to the dust, and that dust contained asbestos fibers. These are known by Boston mesothelioma lawyers as take home asbestos cases. Take home asbestos case often involve victims who were exposed at much younger age so they are typically much younger when diagnosed with mesothelioma. The typical Boston mesothelioma cases often involve much older victims due to the fact that it takes between 20 and 50 years for most patients to develop detectable symptoms. The initial exposure in these cases often occurs at work, so that is why they are typically much older plaintiffs. One legal issue is whether the manufacturer of the asbestos dust or the persons and companies who knowingly exposed those workers to the deadly asbestos fibers owed a duty of care to those family members in take home asbestos case. An asbestos case is a negligence based lawsuit, the elements that must be proven are duty, breach, causation and damages. The duty is a duty of care to prevent foreseeable plaintiffs and property from foreseeable injury. There is no question that mesothelioma and other serious respiratory illness such as asbestosis. The question is whether the family members are foreseeable persons. There should be no question, but this is big issue in many mesothelioma lawsuits so you should speak with an experienced mesothelioma lawyer about the facts of your particular case.